Looking For a Solution to Procure a Unique or Obsolete Component? DATEL Specializes in Replacing and Enhancing Obsolete Microcircuits. 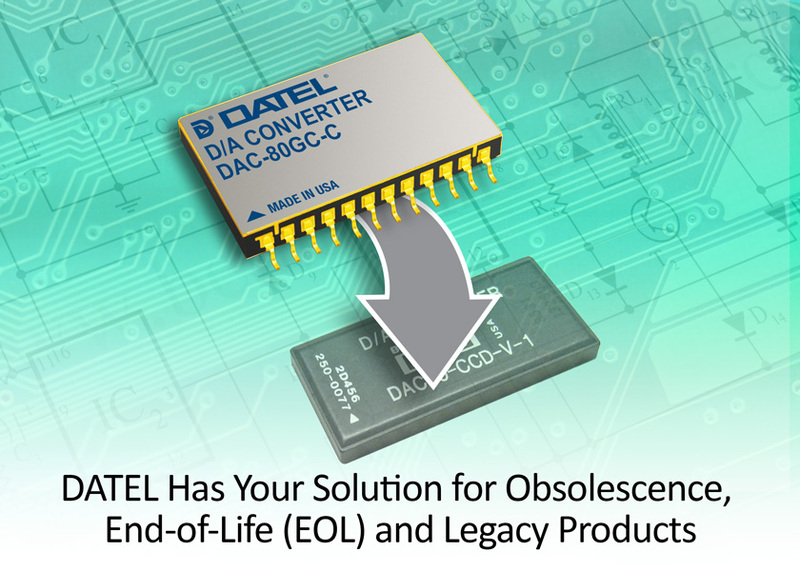 As a premier designer and manufacturer of Data Acquisition Systems and components for over 40 years, DATEL is frequently approached by our customers to help them resolve obsolescence, End-of-Life (EOL) and/or reduced access to qualified legacy products. We are uniquely positioned to provide alternative solutions to on-going and mature defense and aerospace programs which suffer from Diminishing Supplier-Base issues. DATEL is an established supplier of Data Acquisition and Analog products, including industry's best A/D and D/A Converters, Sample-Hold Amplifiers, CCD Signal Processors / Imaging Converters, Multi-Channel Data Acquisition Systems and many other customs Multi-Chip Modules (MCM). We maintain MIL-PRF-38534, Class H Certification to offer our customers many features and capabilities, including: MIL-STD-883 Screening, Customized Testing and Packaging. In addition to our standard products, DATEL also offers custom designs for new and legacy systems, form-fit-function replacement for obsolete components, build to print manufacturing and custom thick-film substrate manufacturing services. Our Manufacturing and Design Capabilities position DATEL as a reliable partner to resolve industry's ever-increasing legacy, obsolescence, and diminishing supplier-base problems. DATEL, Inc specializes in custom multi-chip solutions to replace or enhance obsolete microcircuits! DATEL is an employee owned US-based company that is dedicated to the commercial, medical, industrial, military and aerospace market solutions. We are an employee-owned, US-based company, dedicated to commercial, medical, industrial, military and aerospace market solutions. For several decades DATEL has worked closely with its customers to provide high quality industrial and MIL Certified 883 products which meet specific and stringent application, screening and environmental demands. DATEL's data acquisition, including A/D and D/A Converters, CCD Signal Processors / Imaging Converters, Single-Package multi-Channel Data Acquisition Systems, Custom System-in-a-Package (SIP) Hybrid Solutions, Sample/Hold Amplifiers and other products are designed and manufactured in a MIL-PRF-38534 hybrid certified fabrication facility located in Mansfield, Massachusetts, USA. DATEL product offering has grown to become one of the industry's broadest, designed to meet the ever-changing requirements of military, HI-REL, medical, scientific and industrial applications. DATEL is ISO-9001 certified, and ITAR registered.